MISSION — Aliah Garza, who is 6 years old, glided down the runway of the Mission High School gymnasium in her golden yellow ball gown Thursday night, showing no evidence that she was nervous about tripping. 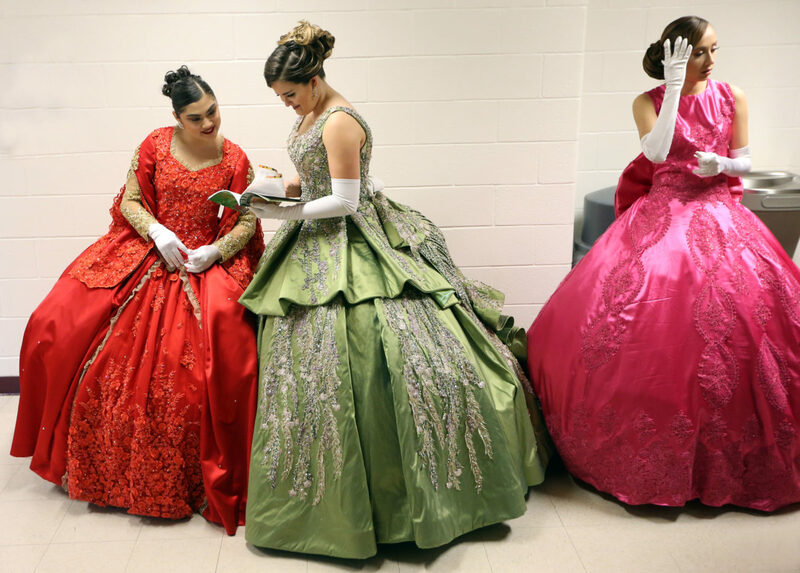 Garza was one of the six princesses and 22 duchesses poised on stage at the 82nd annual Texas Citrus Fiesta, awaiting the crowning of King Citrus and Queen Citrianna. Her dress was accented with shimmering floral trim at her puffed sleeves and had silver rhinestones lining her waist. Her skirt was sprinkled with gems and the bow at her back was cinched with a bouquet of bright yellow lemons. Though she enjoys the glamorous outfits and hair-dos, Garza said that she knows that her role as a princess goes beyond what she wears. The event was founded by Paul Ord and the Young Men’s Business League in 1932 as a gesture of celebration for the bountiful winter harvest that December. Since then, the Texas Citrus Fiesta has kept the tradition alive, and the fruit growing. The first commercial shipment of citrus, which was packaged in onion crates, left the Rio Grande Valley in 1920, beginning the rise of the citrus industry here. Local growers now produce more than 9 million cartons of grapefruit every year, ranking the Texas citrus industry third nationwide. Because of climate conditions and water availability, Texas citrus production is limited to the RGV. Bill Filut, president of Texas Citrus Fiesta, says that the aim of the event is to highlight the importance of citrus in the Valley, and honor those who contribute to the industry’s success. Citrus is a $200 million industry in the Valley, sending produce overseas to Germany, Japan and England. Filut says that the star ruby grapefruit is the most popular fruit right now, but his favorite is the Hamlin orange. The annual parade features floats decorated with citrus products. Colleen DeGuzman is a staff writer for The Monitor. She can be reached at (956) 683-4424 or cdeguzman@themonitor.com.